Two Excellent Nights On The Bounce. The night of Friday 22nd was clear, cool and very dark. Recently, temperatures across the UK have dropped which has settled the atmosphere down and improved seeing. This combination added to the current moon phase meant that this had to be one of the best observing nights so far this year, definitely the best since winter. It was one of those nights where you just wished that it went on for much longer than it actually did. 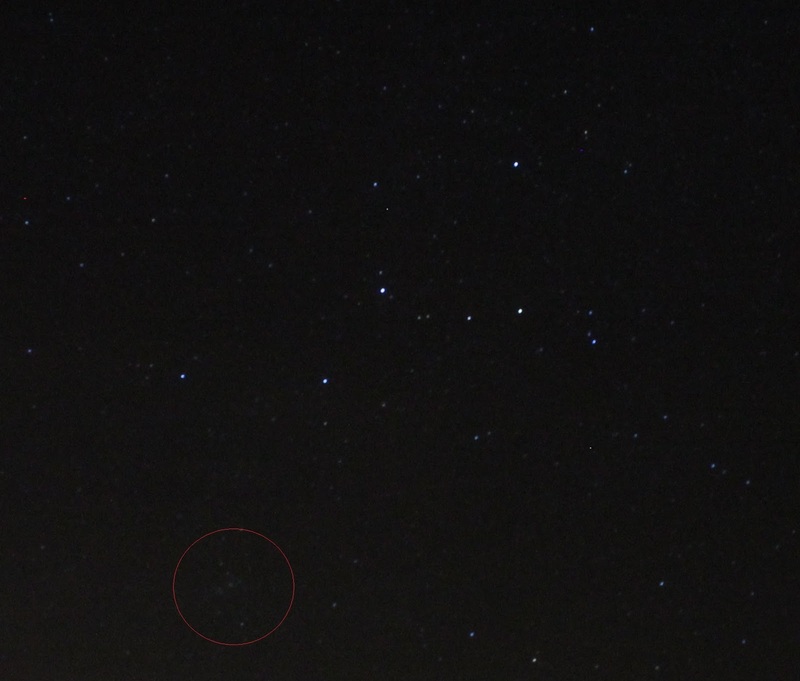 In my previous post where I wrote about my attempt to capture E2 Jacques, I mentioned that I had possibly caught a glimpse of a double cluster. So, I decided the area of sky I was first going to target was the constellation of Cassiopeia. In my search for the comet, I happened across an open cluster. An unusual one really, and a first for me where I am looking for one target but come across something else of note. A little more research and checking of my Cambridge Star Atlas told me that what I had in fact located was NGC 637. An open cluster. In my notes from the night, I've just listed it as a faint fuzzy. I found it hard to resolve any specific stars in the cluster. but definitely a bonus tick and a good start to the night. Back to the photo and the double cluster. I had identified via the photograph a double cluster in Cassiopeia NGC 884 and 869. When I located these two using the scope, I thought they were fantastic. Both of these were showing as very bright open clusters on an inky black background of sky. Now, this was also chance to get first light with my new BST 12 and 15mm Starguiders. Initially, I found the double cluster using the 25 mm EP which gave me excellent views, but using first the 15 mm, and then the 12 mm, I was able to concentrate on each cluster individually. I wasn't disappointed. I was able to fully resolve dozens of individual stars in each cluster. I must have speant over 20 minutes looking at these two clusters alone. Certainly a target I will revisit in the future. Seeing is v.good tonight. Clearest for a long while. Whilst in this area of the sky, knowing that the seeing was very good, I decided to pick out the old favorite of Andromeda and local objects, M32 and M33. Using the 25mm (which is usually the EP I always start off with) Andromeda did it's usual thing of filling the EP, but even more so on this night. The extreme edges of the outer arms were well and truly out of the field of view of the EP. A truly magnificent site. At 15mm, I was able to pick out more detail surrounding the central core of the galaxy. As the view was so good, I decided to make use of the DSLR camera that I brought outside with me. I have a direct attachment for DSLRs on the tube rings of the telescope, so I decided to remove my Telrad and mount the DSLR on the scope. Exposure time was going to be limited, and focus was going to be a challenge, but I was willing to give it a go. I took around half a dozen or so test frames and played with the settings on the camera until I got to something that was in my opinion, acceptable for what I wanted to achieve. Without having the laptop available and connected to the camera, it was always going to be a bit hit and miss with focus, but I got somewhere close. In the original largest image, there is evidence of trailing, but for a small picture like this, I think it is just fine. This image has had no post processing. Once my brief visit to photography was over, I started back on the observing. 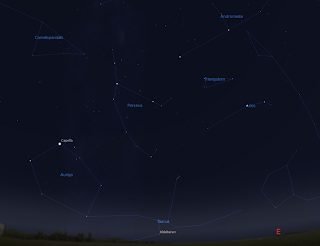 I decided to leave Cassiopeia, and start looking at some other constellations. Delphinus and Sagitta were now easily visible above the roof line of the house, so it was time to pay them a visit. I started off with a quick re-visit to M71. It was a brief visit to this magnitude 7.1 cluster, but with the improved seeing conditions, resolving stars in the cluster was easier than before. And finally for this night, I swung the scope around towards Triangulum and M33, the Triangulum Galaxy. This was still low to the limit of my observable sky from my spot in the back garden, and truth be told, wouldn't usually be something I would bother with because of a white LED streetlight and other such delights in that direction. Alas, when I did find it, it was disappointingly washed out. But that didn't detract from a fantastic and memorable nights observing whatsoever. I had to call an end to the night by around 12.30 and pack up for an 8.30 tee was beckoning the next morning meaning a 6.30 get up time. The next night, although equally as good in terms of conditions, tiredness curbed my enthusiasm somewhat meaning that I only actually got round to observing a single target. A combination of annoying neighbors lights, frustration at not being able to locate my desired targets in Ophiuchus and general tiredness made me think the better place to be on this one occasion was tucked up in bed. The target for the night was M15. A globular cluster in the lower right of Pegasus. Using the 25mm EP, it looked to me like a small fuzzy star. However, when I increased magnification to the 15mm EP, the cluster was more defined with brightness in the centre but dimming quickly outwards. When I observed this target, true darkness had not yet arrived, so I shall have to re-visit this in the future. From the last 3 or 4 nights, I would say that all of them could have been to be observable nights at one point or other. Alas, due to work commitments, I haven't been able to observe on any of them. Not to worry though, the coming weekend looks goo, so with clear skies forecast, and the moon showing very little, I'm looking forward to a good weekend. This good spell of conditions should coincide quite nicely with passing of come E2/Jacques with Cassiopeia. I look forward to it as the comet is putting on a reasonable display and is easily observable in scopes of the size that I own. Though there has been plenty of work for me in the evenings and nights so far this week, I did manage to get outside with the DSLR last night and take a few frames before some high level cloud rolled in. These are experimental photos and have had minimal processing. Hopefully on the weekend, I will have the chance to try out some prime focus photography. I will post the results if and when I manage to get them. , it was going to easy to locate. To help with it's identification, I have circled it in red. It's quite tricky to pick out on a picture this size - but trust me, it is there! With my attention on the Cassiopeia constellation, I though I would take a wider field show to capture the constellation as a whole. When I reviewed the photos afterwards, as well as the constellation, I also managed two globular clusters in the same vicinity. After some research with my new copy of The Cambridge Star atlas (birthday pressie from the Jefferies household) I was able to identify them as NGC 869 and NGC 884. 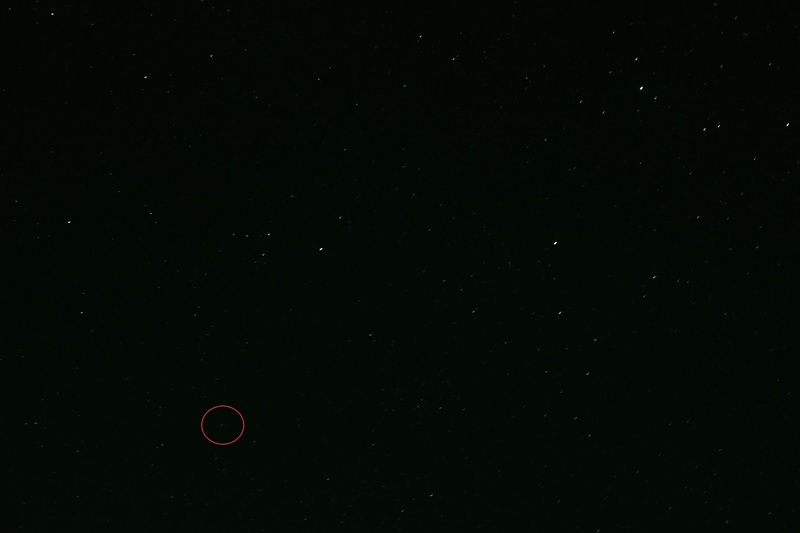 Though in the vicinity of Cassiopeia, they are actually cataloged as being in Perseus. Both of them are approximately 4.4 in magnitude. The new arrivals have, well, arrived I suppose is the best way of putting it. The collection is now complete as can be seen here. Hopefully, I will get some observing chances in the coming days to get first light on the new EPs and filter. Tonight and tomorrow brings us the peak of the Perseid meteor shower. It’s generally one of the best meteor shower shows of the year, but this year it coincides with quite a full and bright moon that will unfortunately mean that on the brighter meteors are going to visible. The name of the meteor shower is taken from the constellation in the sky nearest to the radiant of the meteor shower. In this case, the constellation or Perseus. The actual meteor shower itself is cause by the orbit of the Earth passing through the dust and particle trail of a comet long since past. During the passes of comet Swift-Tuttle, a debris trail or particles was left behind which now burns up in the atmosphere as the earth passes through that trail. A Perseid meteor can appear anywhere in the sky, but you will know it is a Perseid if it appears to travel away from Perseus. So, this past weekend came and went the back end of Bertha. Bertha being the left over low pressure system of Hurricane Bertha that has tracked across the Atlantic and found our shores. This has brought quite a bit of rain to the area, and thus, prevented much in the way of observing. Today, I officially blamed Jim for the bad weather due to him taking delivery of the JLT, and it seems the laws of astronomy have bitten with vengeance. But, I’m afraid to say that there have been other developments that haven’t help improve the situation. Yesterday, I made some astro purchases of my own, and hopefully tomorrow, I should be in possession of two new EPs and a new filter. Since I first came across, and then, bought my first BST Starguider EP, my intention was to eventually get the full set. So, I’ve just ordered the 12mm and 15mm pieces to complete the collection. I have bought these from Alan at Skys The Limit. The other purchase is the Skywatcher OIII filter from First Light Optics. I now have a full complement of EPs and four of the main filters (UHC, OIII, LP and Moon). Recently, the news has also been full of hype on the latest buzzword ‘Supermoon’. Actually, if you go along with the news, and the buzz, this is actually the third supermoon of this year. Only recently have I heard more and more people referring to these lunar event as a supermoon. The term has been used to describe the apparent size and brightness of the moon in relation to its closest orbital distance (perigee) to the Earth. Actually, the time at which this is most evident is at moonrise. Once the moon has risen well clear of the horizon, the actual size of the full moon looks much the same as any other full moon during the lunar cycles. It seems the media and various publications have got hold of this term and pushed it out into the public domain, whereas in reality, I don’t think it’s anything special. Finally, something to look forward to later in the month of August, in fact, right at the end of August. Hopefully, it will be a cloud free evening, and I will be able to see the moon and Saturn approximately 0.5 degrees apart from each other at around 8.30pm. the sky will still be reasonably light then, but Saturn will be at mag. +0.9 which should be bright enough to see quite well at that time of evening. Next on the list for me is to continue my research into the dobsonian mount construction of the Skywatcher Skyliner series of truss telescopes J! And of course, perhaps catch a sighting of a few early Perseids this evening. And thanks for stopping by to take a look at my blog. I’ve spent a bit of time revamping the blog to make it a bit easier to read and follow. All my previous posts have been put into one section on a different page. From now on, all my posts should appear in some sort of ‘newest first’ order. Thought it would make a bit more sense than having to scroll through a full page just to see the latest entry. So, the rest is the same, and what it says across the top of this page still stands! Not claiming to be genius, a know all, or not even knowledgeable on the subject. I’m just interested, that’s all. And so to matters of more interest. There’s plenty of interest going on in the astronomy world this week. 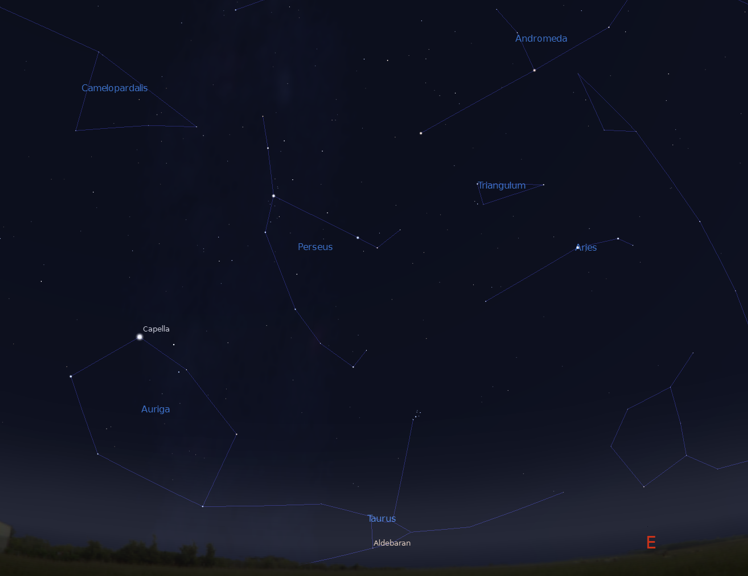 Over the recent clear nights, we may have seen the start of the annual Perseid meteor showers. Although the peak of the shower doesn’t arrive until the late night/early hours (UK time) of the 12th/13th August, there have been reports of an increase in meteor activity during the beginning of this month. This year, the moon will be quite full, so if we have a good clear night on the 13th, many of the meteors might be washed out by bright moonlight. That doesn’t mean we won’t see any though. And the good thing about meteor spotting – it’s easy, and generally speaking, most people have the equipment needed to spot them. <! [if !supportLists]>1. <! [endif]> Visibility of the clear sky – the darker the better. <! [if !supportLists]>2. <! [endif]>A reclining chair, sun lounger, camp bed or similar. <! [if !supportLists]>3. <! [endif]>A glass/bottle/suitable quantity of your favourite wine/beer/spirit. Delete as appropriate, if appropriate. Then, sprawl out, look up, get slowly sloshed and watch the universe go by, hopefully catching a few meteors along the way! This week has also seen the return of the ISS to our night time skies. In fact, there have been multiple passes on many nights. There are many apps out there which will give the times of the ISS passes over the UK skies. But, perhaps one of the best sources of information I have come across is by following @VirtualAstro on Twitter. No matter how many times I see the passing of the ISS, it’s still an awesome sight to behold. I’ve had a couple of observing sessions in the last week and have been happily distracted by some really bright passes. And there you have it, a brief re-introduction come re-launch of the blog layout. Please feel free to leave comments. They are all moderated before being posted so won’t show automatically, so please don’t be offended if they don’t appear straight away.